Welcome to the Movie-cards site! 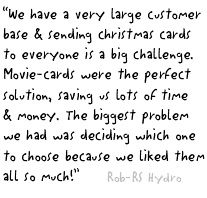 Movie-cards produce animated corporate Christmas cards and festive eCards, customised for a company to be sent out easily via the internet. They serve as a replacement or addition to traditional festive cards sent out by business to extend greetings to customers and contacts worldwide. Movie-cards has been providing corporate Christmas ecards since 2008. All the ecards are professionally designed, animated online greetings for business, customised with your company logo & message. They are suitable for large and small businesses alike, saving your business valuable time and money. They are an environmentally friendly way to send your greeting to an unlimited number of contacts at a fixed price. Your movie-card is hosted on a dedicated page which also links to your website. There are two collections of animated corporate Christmas cards to choose from depending on the look you want for your business - Fun Collection: light hearted to make your contacts smile, Classic Collection: for that more corporate feel. Whichever your choice you can extend Season's Greetings to your existing and prospective customers, promote your business worldwide & advertise any charity that you are supporting. Just choose a corporate Christmas eCard from either of the collections and have your chosen business greeting movie-card customised with your company logo and message which will be ready to be sent out to all your clients with just a simple click of a button. Click on the Fun or Classic Collection links above to see the movie-cards available, and find the right one for you.